This is the last post in the 3-part “Engaging new users” series. Part 1 covered guided interaction, the practice of educating users in a realistic context, and how it is more compelling than slideshows, videos or static instruction. In part 2, we learned how to use free samples to demonstrate a product’s value proposition and build the trust needed to encourage sign-up. And in today’s post, part 3, we’ll examine how giving new users a personal focus is the key to making these onboarding techniques stick. A few years ago I volunteered at a hackathon, with the goal of mentoring female K-12 students as they built their first mobile apps. The students were excited to present their creations on the same stage as senior developers. We volunteers were excited to impart our knowledge of app design to a new generation of makers. However, we didn’t have such a great start. We thought it would be efficient to gather all of the girls into a large group so that we could take turns explaining all aspects of good app design, based on what we knew to be important. After all, we had been building apps for years! We were the pros! We knew what matters! Yet it became clear that this format wasn’t helping anyone. One smaller group of girls looked particularly frustrated. We took a break. I sat down with the frustrated students and asked them what they wanted to create. Their eyes lit up. They eagerly told me how much they loved LEGOs and how they wanted to make a game where people built insane structures with colorful bricks. They could have cared less about the group lecture, because they couldn’t see what it had to do with their very specific idea. Therefore, the volunteers and I bailed on our large group talk and just worked directly with the students. I took opportunities to explain app design essentials when it became relevant to the design process, often using LEGO bricks as metaphors. I didn’t cover nearly as much information as I would have in the lecture format, but, by focusing on their goals, the students were motivated to learn along the way. And they gave an awesome presentation at the hackathon closing ceremony. The lesson here is as applicable to product design as it is to education: we often inundate new users with what WE think they need, instead of taking the time to learn what would benefit them. This often happens out of fear that people will never discover all of the features we have poured our blood, sweat and tears into unless it’s shown on day 1. The result is that we carpet bomb our new users with a lot of unfiltered information, and anything meaningful ends up lost in the noise. From Barry Schwartz’s The Paradox of Choice to research showing how clutter increases stress we know that information overload has detrimental results. But this is less an issue with the amount of content and more an issue with its lack of meaning. 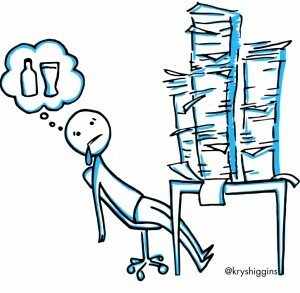 For example, if you work in a cluttered environment where the mess is not your own, you’ll be more stressed than if you work in clutter that is of your own making (aka the “organized mess”). Just as how good teachers acquire relevant knowledge about students and use it to tailor their course design, we need to help new users attach finding the meaning in our products. Let’s examine how we can acquire relevant knowledge about our users to make a more motivating first impression. We can learn about our customers in two ways: explicitly, or implicitly. When we explicitly learn about our users, we’re asking them to declare something about themselves. This is also referred to as customization. This can be done by presenting a question, filters, or a multi-step wizard. Explicit learning gets the user actively engaged, so it has benefits similar to guided interaction. VolunteerMatch asks new users to declare what kind of cause they care about, using either the search box or shortcut buttons. The user can still opt to browse the rest of their website without answering this request. 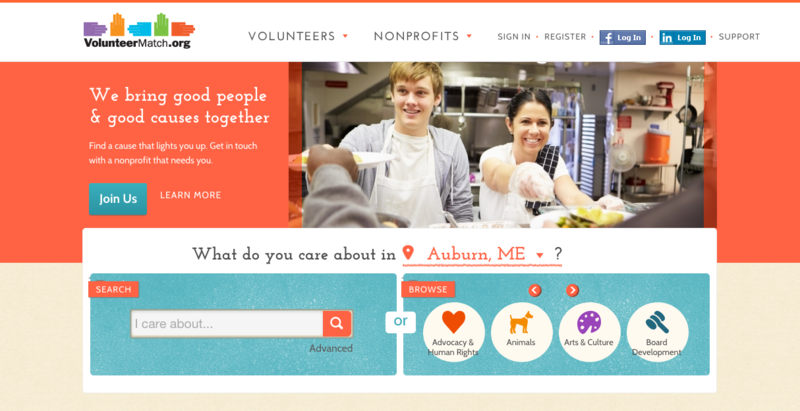 But simply posing the question shows users that VolunteerMatch can cater to their needs. Sometimes a binary answer is not enough to craft a complex, personal filter of a new user’s content. 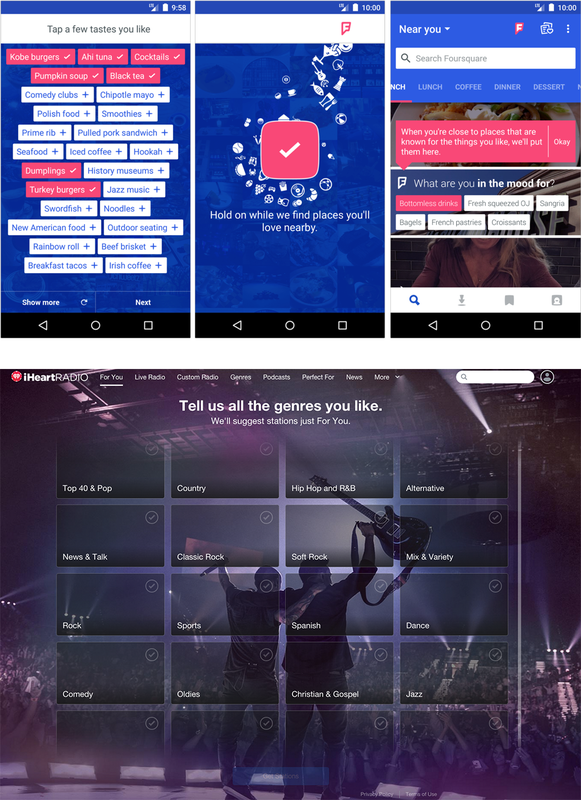 In this case, you can have a new user select multiple interests from a large set, like in these examples from iHeartRadio and Foursquare. Duolingo is a language learning website. A new user is asked to take a placement test, which is used to customize their course plan based on their demonstrated knowledge of the language. 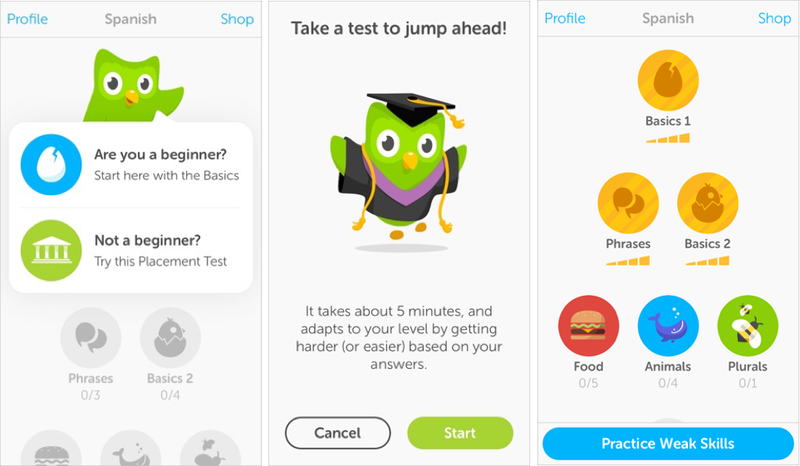 Not all products can get away with an involved quiz, but it works for Duolingo because it’s in the same format as the future language lessons a user will take. You can also string together a series of customization steps if it takes 2-3 different inputs or multiple layers of filtering to reach a reasonable level of personal focus. In these cases a setup wizard pattern may be appropriate. This pattern started with older device and software setup, wherein a series of conditions needed to be met before the product becomes functional. On websites and in apps, these wizards can be optional but always much more fun. They may also be known as profile builders. 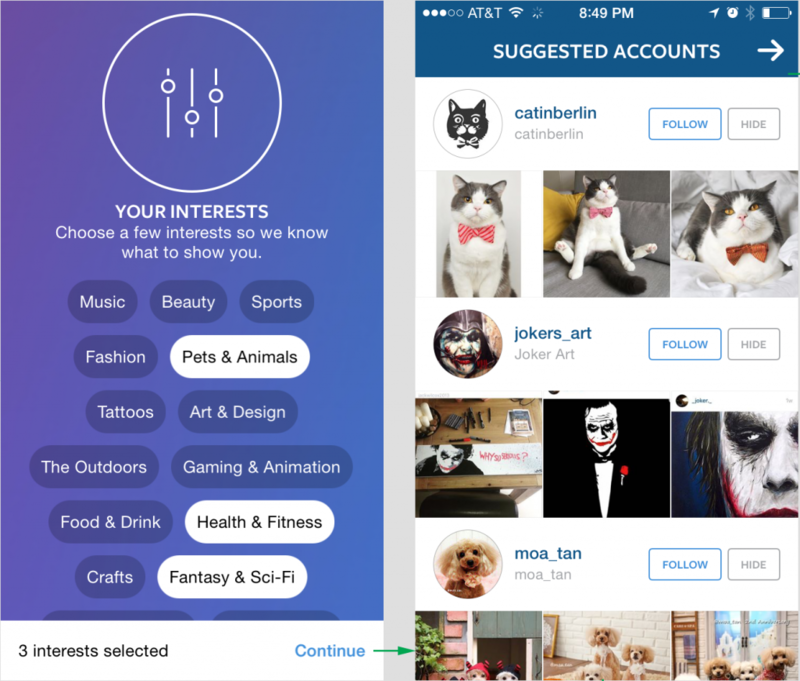 Instagram’s setup wizard first has a step where the new user selects their interests. Then, it uses their response to curate a list of suggested accounts in the second step. Instagram knows that getting a user to follow accounts they care about as quickly as possible is key to retention. On the other side of the coin is the option to learn about our users implicitly. In implicit learning, we avoid making the user do extra work by inferring information about them from their context. This is also referred to as personalization. You don’t need a sophisticated learning algorithm to personalize (algorithms are only likely to help *after* a user is fully engaged with your site or app, anyways). Implicit learning can be achieved through some simple contextual triggers. By knowing a person’s city, region, or country, we can pre-filter content and show relevant shortcuts. For example, a university website might use the nearest city to call out local admissions events. On websites, you can find out the user’s rough location using an IP geolocation API like ipinfo.io or via timezone lookup (see below), no permission required. An exact location can be determined through HTML5 geolocation (permission required). Apps generally require a user’s permission to get location data. 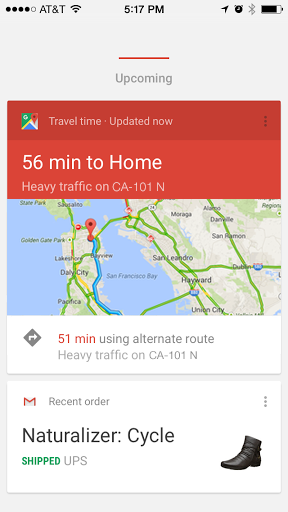 Follow these links to read up on Android and iOS location strategies. You may ask, “what’s the point of knowing it’s Tuesday?” But date and time can be powerful when compared against the habits of your audience. Think about this context relative to the current weather season, morning or evening meals and commutes, upcoming holidays and events, tax due dates, or even local pay days. This context works best when coupled with location information. Web developers can gather timezone information by running a client-side script (you can also get date/time info from the server, but that can be quite different than the client). Android developers can use the TimeZone class and iOS developers can read up on date and time strategies here. 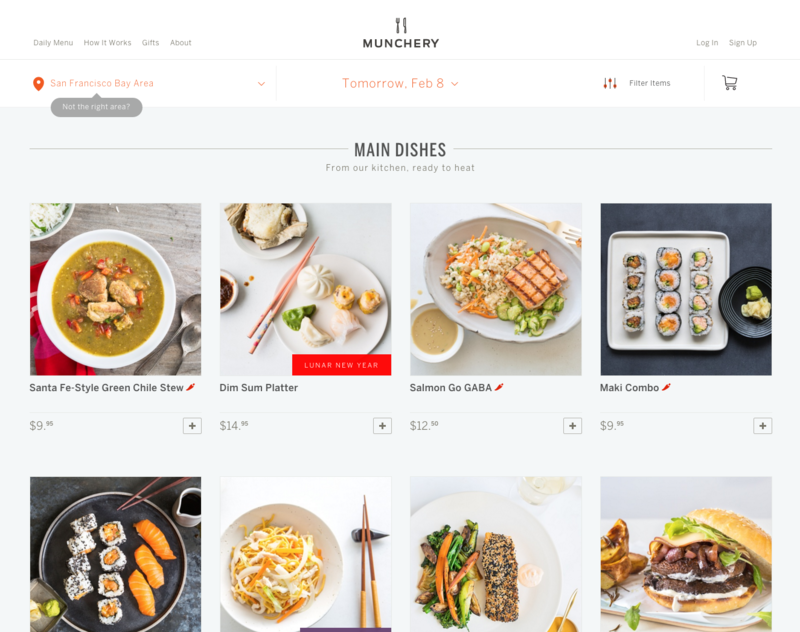 Munchery, a meal delivery service, uses general location data and time to immediately show the new user the meals they can have delivered to their area on the next available delivery day. Incoming searches: Search providers may already deliver new users to the most relevant section of your site, so a good SEO strategy is important. You may also be able to parse search keywords directly, which could further help you show the specific content a user came looking for. Promotional links: Coupons, ads, and/or printed QR codes, each with a unique tracking ID that you’ve attached to them. Recommendations from existing users: When an existing customer sends out a referral link, discount or gift card from your product to someone they know. Referring sites or apps: Did the user come from a news site or social media? Julep is a cosmetics retailer. 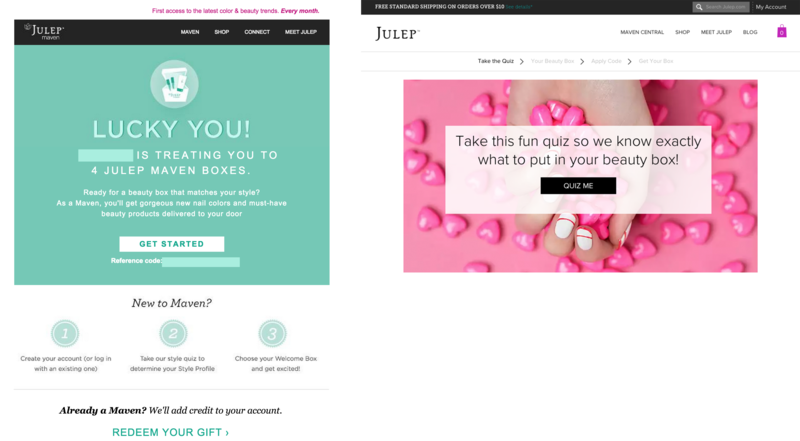 If a new user is referred to the Julep’s monthly delivery program, Maven, via a friend’s gift, it directly places that new user in the context of setting up their personalized subscription. Too often this context is only used to validate ad campaigns. Using referrals well means not just knowing which sources are effective, but also creating different destinations (landing pages, content filters, etc) based on those sources. There are a number of web analytics tools that you can use to make referral tracking easier. And apps can also determine referral sources, like campaign tracking through Google Play. At first, this context seems only useful for layout reflows based on screen resolution. But there is a lot of information that can come bundled with knowing what device the user is accessing your product from. Device type, OS and/or browser: This can be used to activate special features for users of the latest device, or gracefully degrade functionality for older device users. Web developers: Be very careful with redirecting user to a mobile-specific version of your website. People do not like to feel like they get a watered-down version of your content on mobile. I’m an advocate for responsive website design, not a separate mobile website, for this reason. Signal strength: Offer content appropriate for the connectivity level, or an offline experience. Content on device (requires permission): Some app platforms allow you to know if a user has certain apps installed or what music they have in their library. Uber’s website checks to see whether it’s being viewed on a mobile device. If it is, then the site shows a prompt to download their mobile app at the bottom of the home page. 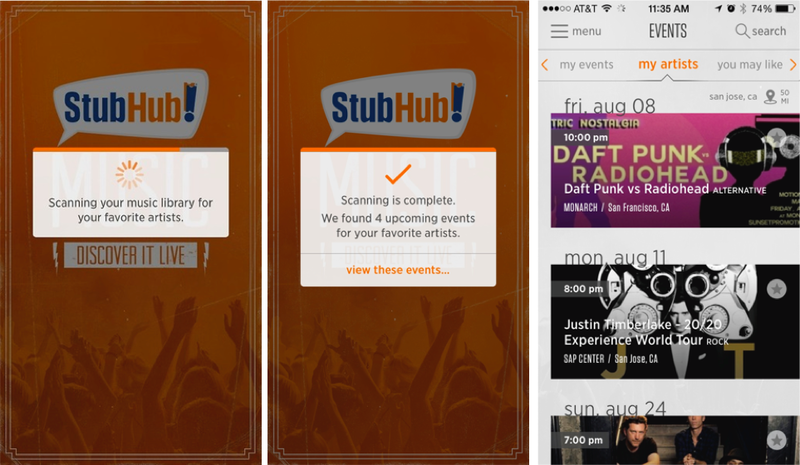 Stubhub scans a new user’s music library to give them a view of their app that is focused on events in their area for artists they love. 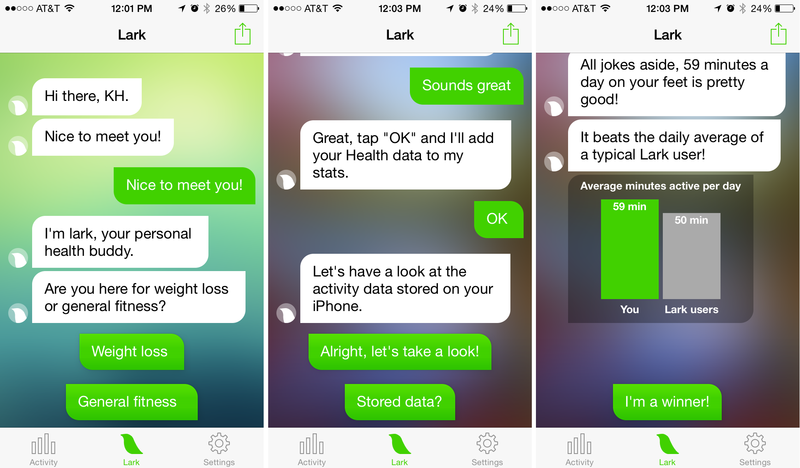 Lark is a personal health coach. It combines explicit and implicit learning via a chat-like interface. It asks the user explicitly about their fitness goals, then asks for permission to access their phone’s motion data history, which allows it to implicitly determine the user’s current activity level and provide relevant coaching. Personal focus can be powerful. But it can backfire on us if we use it inappropriately. Keep the following tenets in mind. Don’t be creepy: Don’t ask the user to provide more information than is clearly necessary. Don’t over-personalize in ways that would make a new person feel uncomfortable. Justify any request for information or permission. Make it immediately valuable: If a user is going to explicitly declare information or grant a permission, it should have an immediate, noticeable and valuable effect on their experience. This is how you build trust. And remember, prompt for signup after delivering on value–signup flows alone do not make for an immediate personal focus. Save their state. When cookies or local storage are available, save the user’s learnings so they don’t have to provide the same information or permission again. While you can suggest a user create an account to save that information, be very careful about playing to their fear of loss. Give them control. Whether the user’s experience has been explicitly customized or implicitly personalized, give them an obvious way to change or undo those filters. Once you’ve determined what you want to know about your user and how you’ll learn it, you need to plan for the variety of learnings you’ll get. Different users will respond to the same prompt for information differently. Define clear rules and set up user segments to deliver users to best experience for them. You’ll also want to create an elegant default experience, because users can always ignore questions, deny permissions, or go incognito. On-demand help (forums, customer support, help section): Give the user the power to ask questions about YOU. They may have specific needs or interests that you can’t reasonably anticipate or show to everyone. Design clear and accessible hooks into this on-demand content. Other channels – Emails and notifications are other ways you might reach out to a user with more detailed content. When you demonstrate to your new user that you have their interests in mind, make sure you keep it up! Grow with the user as they interact with your site or app so you can give them even more tailored education over time. For existing users, you can reuse components from a user-guided tutorial or try a new free sample to introduce them to a feature that would benefit their common behaviors. You could use those same components to illustrate changes in a new release that affect their workflow, instead of showing them an unfiltered list of new features. 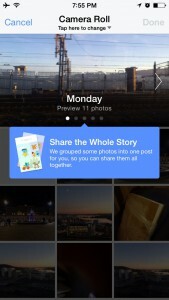 Facebook gradually reveals new features when an existing user triggers a need for them. You can also tell if the user is beginning to lapse, so you can reach out to via another channel to re-engage them. Onboarding doesn’t end after the new user first enters your product; it can continue for weeks, months, years. In the HR world it’s presumed that new employee onboarding is a minimum 6 month process (PeopleAdmin asserts that it’s a 1-2 year process). In our products, personal focus is what allows us to take our investment in guided interaction and free samples and turn it into a platform for continued education and engagement. Thanks for reading the series, and I look forward to hearing about your long-term onboarding plans!